Launched in 1956, the Rolex Day-Date has been the archetypal dress watch from the archetypal watchmaker for generations now. Crafted only in the very finest of materials and subject to an almost constant succession of updates in technology and microengineering over the years, it has long been the backbone of the brand’s prodigious output; one of the most aspirational timepieces ever offered. But, let’s face it; it is quite a serious watch. 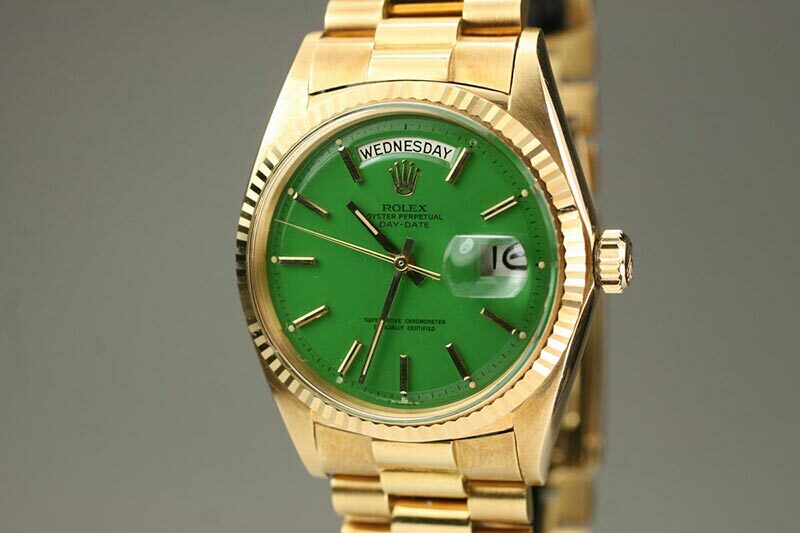 Nothing about the Rolex Day-Date suggests the wearer might be up for a spot of lighthearted fun at any moment. With its sober, conservative face and the formality at the heart of its design, it has the weighty air of solemnity about it. Even the unofficial nickname of The President is inescapably business-like. However, the 1970s brought with it a unique sense of whimsicality that permeated even behind the fortress doors of Rolex HQ. For a brief moment, the poker face dropped and special versions of the watch appeared outfitted with some of the most luridly colorful dials ever seen before or since. Made from a lacquered, multi-layered enamel, the ultra-conventional model was suddenly available in retina-threateningly bright pink, orange, green, turquoise and a host of other colors never found in nature. The overall effect was akin to the psychedelic paint job on John Lennon’s Rolls Royce; a watch as traditional and old-school as a Brooklyn brownstone dragged into the modern era to appeal to a completely different type of buyer. Originally targeted at the Middle East market, the Stella dial watches (named either in reference to American artist Frank Stella and his choice of extremely bright colors, or after the Latin word meaning ‘star’, no one seems quite sure) failed to find a particularly enthusiastic response in their day, leading to a short-lived production run. Today, though, the vibrant charms of the Stella Rolexes are enjoying something of a mini revival on the pre-owned market. The unlikely pairing of a garish color scheme on a watch firmly associated with the establishment is one that is subversive enough to attract an audience of present day rebels. Prices for vintage pieces have been climbing steadily in the last few years, and the modest 36mm dimensions have led to as many women as men seeking out the increasingly rare editions. Because the dials were made from solid enamel, finding one in good condition is becoming more and more of a challenge as the material is prone to cracking. 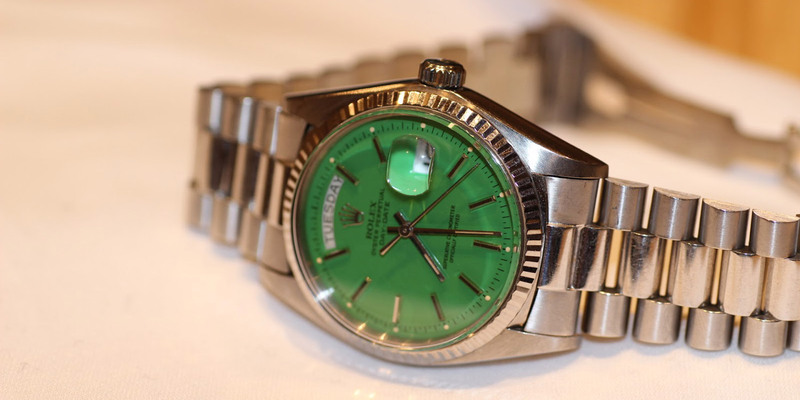 However, they are proving so popular that Rolex has taken steps to capitalize on their resurgence and brought out a fresh series of kaleidoscopic Day-Dates for the 21st century. Unveiled at Baselworld 2013, six different versions were released simultaneously in a range of peacockish colors—blue, cherry, chocolate, Rhodium, green and cognac. Stella dials in all but name, the new watches sit on leather straps in identically matched tones, which not only takes the President further down the road to informality but also reduces the buy-in price for one of Rolex’s, and horology’s, eternally classic watches. The colors on this contemporary crop are, if anything, actually more vivid than the 1970s originals. All the paint used on the enamel Stella dials of yesteryear was mixed by hand, so even watches that were purported to be the same color varied slightly between batches. These days, the enamel has been replaced with harder-wearing brass, and now shine with a vitality that’s impossible to miss. Away from the flamboyance, the Day-Date is as beautifully engineered as ever. The neo-Stella series stays at the traditional 36mm, with cases offered exclusively in Rolex’s own 18k gold. Inside, the Cal. 3155 provides the power, a movement made so well 30 years ago that it has never needed to be updated. Running at 28,800vph, it gives the trademark eight beats per second tick to the smoothly sweeping seconds hand. 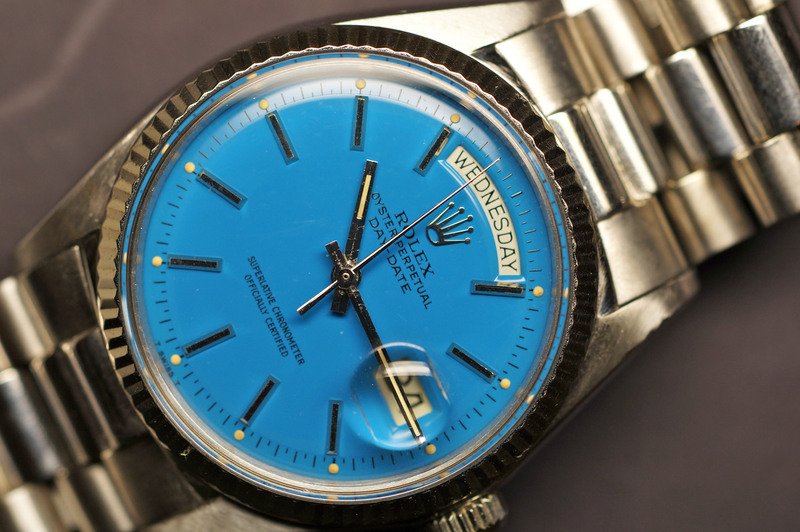 Replacing its predecessor in 1988, it brought the convenience of a Double Quickset function to the President for the first time, so wearers are able to advance both the day of the week and the date with just a twist of the crown. It uses the well-proven set up of free-sprung Nivarox hairspring with Breguet overcoil, and a Microstella regulated Glucydur balance wheel. The band is made from the highest quality alligator hide and comes complete with the new adjustable folding Crownclasp, made exclusively for Rolex’s latest range of leather straps. The case itself is finished with additional end pieces so there is no gap between the watch and its bracelet—a little extra flourish for the flagship. Day-Dates that rock a Stella Dial make for a great investment. The Stella dials, both old and new, certainly won’t appeal to everyone, and they are not supposed to. Fitting the venerable old warhorse with a face of colorful ostentatiousness is a move that will delight some and scandalize others. What can’t be argued is that it takes the Day-Date along previously unexplored paths, turning the once most ceremonial of watches into one with a great deal more versatility. An ideal choice for summer or just for adding a little something extra to a more casual outfit, it deserves its place on any collector’s wish list or those looking for their next investment piece.